The Zoom To Location tool provides three zoom options: Zoom to Legislative Districts, Zoom to Congressional Districts and Zoom to County. Click the Zoom to icon in the toolbar to launch the Zoom to Location tool. The user can zoom into a particular Legislative District, Congressional District or County. The Zoom to Location results window will list the resultant Legislative District, Congressional District or County and it will be highlighted in yellow on the map. The user can click on the Zoom to Location results window to zoom into the selection. 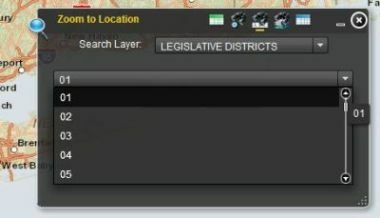 The example shows the user selecting the Legislative District option to zoom in the pull-down menu in the Zoom to Location tool. 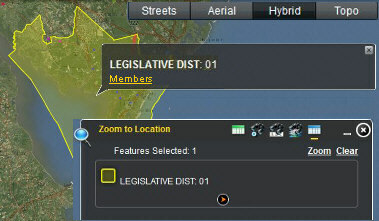 After selecting the Legislative District option the user can choose from another pull-down menu for the specific Legislative District number to zoom to. 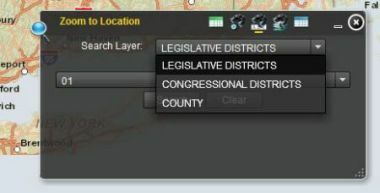 In this example the user is selecting the Legislative District Number 1. Click the Search button. The result of the selection is highlighted on the map, and the user can click on the Zoom to Location results window to zoom to this section on the map. 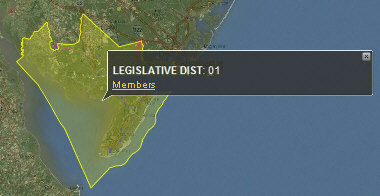 In the Zoom to Location results window the user can click on the small arrow at the bottom of the selection or on the Members link to go to the Legislative Roster of the State of New Jersey.